A couple of windows in our mountain house are rattling against the onslaught of wind gusts up to 78 mph. I'm hunkered down in my warm office working on my autobiography and have finally passed the 1965 year mark after two years of pounding on my computer. Is it hard work? I guess no, because I'm getting so much enjoyment out of documenting my life up until now. I have no idea when I will finally get it all down on paper, but I do know that it will get done. Way too many good—no, great—memories that I am recalling with the aid of almost 12 feet of three-ring binders full of notes of almost every year. I also have three or four file cabinet drawers of trivia to refer to and refresh my mind. And at 87, my mind really needs a lot of refreshing! It also helps to talk to some of my old friends in the ski business, but unfortunately most of them are no longer with us, having skied under the dirt where the snow melts in the spring. 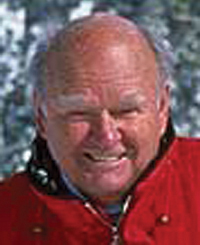 But I did talk yesterday with Dave McCoy, who built Mammoth Mountain. He's 97 years old and out almost every day taking hundreds of still photos as he and his wife, Roma, cruise across the desert in their solar-powered Rhino. For you folks not familiar with a Rhino, it's like a golf cart on steroids. Dave still has youth and ambition in his voice at 97, so it's always a real pleasure to talk with him and view his wonderful still photos of the Eastern Sierra on his website, www.davemccoyphotos.com. Take a look to see his images. We talked about Emile Allais, who was ski school director when I taught for him that first year that Squaw Valley was open in 1950. Last week, Emile celebrated his 100th birthday in his hometown of Megeve, France. Both Emile and Dave have a couple of things in common—their love of the mountains and skiing, and the fact that neither has ever smoked or had to process any alcohol in their bodies. I too have never had a cigarette or a drink of alcohol, so maybe that's why I'm still able to get up in the morning and cook yet another bowl of oatmeal and come up here and work on my word processor. In working on my autobiography, I long ago discovered that my camera was a magnet that attracted the world's best skiers over the years. And of course I also trained it on some of the world's best in the first few hours of their first freedom experience on skis. Thirty or more years ago, I could spend the first three or four days filming a group of beginners and there was very little improvement in their ability not to crash on almost every turn. Today, with the improvement in skis, you have to film them within an hour when they first start down the hill on their first run of their life. Skis have become so user friendly that most people can get down from the summit of Mt. Pleasant their first day on skis and do it before lunch time. I recently wrote an entire chapter on ski equipment and its evolution: subjects like Howard Head and his first metal skis in Sun Valley in 1949, the first use of fiberglass in skis and the tens of thousands of dollars that have been put into ski design and engineering. I've been back to ski all over the world and observe the changes as they've happened. Yet in today's world with 78 mph winds howling outside and the electricity going on and off, I lost everything I've written so far. Truly, that just happened so I will try and remember what I was writing about before it went off. Age does bring some short-term memory challenges! Luckily all the earlier years are still tucked in there safely. That was one advantage of my old upright manual typewriter, except that I had to retype the entire document a few times before I got it right. From time to time I'll give you an update on my progress through the last 30 years. My life was a roller coaster ride until 1984 when I met my wife, Laurie, at the top of Baldy in Sun Valley. I had three kids and lived in Manhattan Beach while I ran my film company with a dozen or more employees. She lived in (rainy, I thought) Seattle with a ski school at Snoqualmie Pass and 105 instructors and a ski shop with 47 employees. It was a complicated process to merge or blend the two families. Southern California was already way overcrowded, and the first time I rode a ferry boat from Anacortes to San Juan Island on a bicycle trip with Laurie, Mt. Baker was still snow-covered in the background—while in the foreground a sailboat was reaching across the bay. I had never seen such a combination of my freedom arenas. We started commuting between the two cities, and three years later got married in the living room of the house we built in Vail, Colo. I have thousands of pages of good memories to write about. When will it be finished? I don't know except it will be done when I finish it—sooner if the electricity doesn't go off too often, and later if it does.